Free shipping applies to all wool and cotton bedding. Offer excludes Amish wood furniture products and shipping to HI, AK, or outside the US. 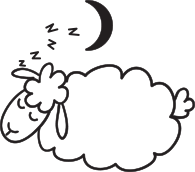 Choosing a comfortable mattress and getting a restful night’s sleep is crucial to your overall well being. The Wool Bed Company™ is dedicated to providing our customers with superior organic wool bedding solutions. The Wool Bed Company™ is Your Solution! Sustainable, organic, eco-friendly bedding from Surround Ewe™ is custom made from natural wool to give you a superior night's sleep. Wool is a natural insulator, keeping you warm and comfortable all night. It’s also breathable and lightweight, creating a comfortable, supportive surface. 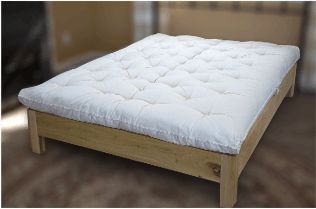 The Wool Bed Company™ has a specialty patented sleep system, utilizing American sourced ECO - Pure™ Wool. No other bedding material available possesses the incredible properties of our patented ECO-Pure Wool bedding. Custom created for each customer, we use decades of experience to create comfortable, supportive wool bedding products. 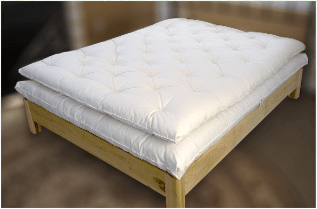 Thousands of satisfied customers have experienced the difference only an organic wool mattress can make. Read through our wool mattress testimonials and learn why our products are the best available. programs provide our customers with a superior experience. 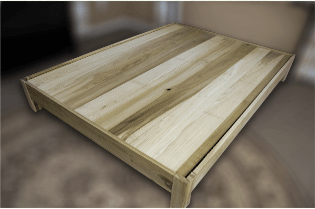 Wool Bed Company™ offers customers quality Amish furniture and custom made pieces. 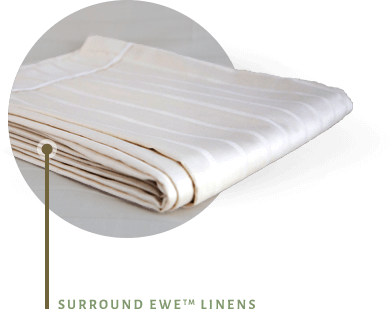 Our Surround Ewe™ Collection of products are custom hand-made using only natural ECO-Pure™ Wool and organic cotton which will not aggravate your allergies. Our patented wool mattress system provides extreme comfort and durability, surpassing all other bedding systems available. The 100% organic cotton is unbleached and not treated with harmful chemicals. Our own ECO-Pure™ Wool is naturally hypoallergenic - resistant to bacterial and dust mite growth. Wool also acts as a natural flame retardant and repels mildew and mold. The Wool Bed Company’™ is a woman-owned and operated business with local Wisconsin roots. Our wool bed store is located just north of Oconomowoc, Wisconsin. We invite you to stop by and try out our products. Feel free to ask questions and share feedback directly with our friendly team - we want to provide the BEST Organic cotton and wool bedding products with exceptional customer service. 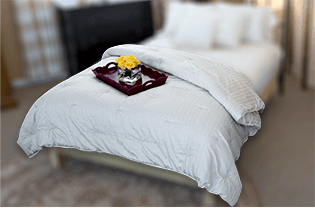 Other synthetic bedding materials and conventional mattresses are sprayed with harmful chemicals, like boron and antimony to comply with the new flame resistance laws. Our organic ECO-Pure™ Wool is naturally flame resistant. 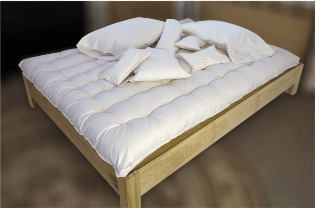 Surround Ewe's™ wool bedding meets all flame resistant requirements, without toxic chemical sprays. Call Susan TODAY to learn more organic Eco-Pure™ wool bedding products at 920-860-6086!